We invested over 15 years to formulate our Five to Seven Step procedure that treats all variants of Acne Scars in about 2 hours. 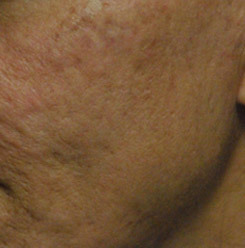 Call to Learn More About the Acne Scar Vitalizer Treatment! 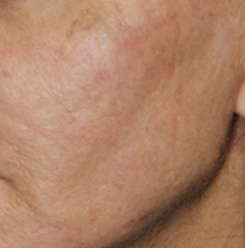 Elevated White and Hypopigmented Scars are quite different to treat. The options include lasering these down with a co2 laser or erbium laser often times these heap right up. Some have tried steroid injections. Unless they are fresh and new scars, the steroid injections won't help. Perhaps the best thing for these type of scars are excisions or the procedure of cutting the scars out. We try to avoid excisions for scar revisions but in this case, this option can be the best. 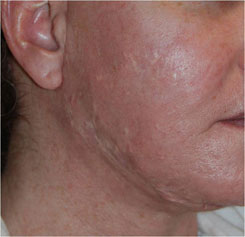 After the excisions we consider the Acne Scar Vitalizer Treatment for further improvement. But there are many times where we will consider using the Acne Scar Vitalizer Treatment without Excision. We can determine the best course of action to treat your individual scars when we see you in person or through a virtual consultation. The above before and after is an example of this process and step wise approach. This patient was very happy with her results and can be seen on our home page. The patient's name is Lark. 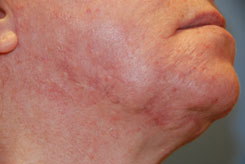 Dr. Young took over 15 years to develop his 5-7 step process to treat all types of acne scars. In the beginning of his career, Dr. Young also did the same traditional methods but he quickly realized was that he didn't like the results he was getting. Over the past 15 years Dr. Young tried every single adult acne scarring mehtod and every year he has incorporated new ways to get better results. Dr. Young current practice is probably 30 to 40% involved in scar treatment and a big part of that scar treatment is directed at improving acne scarring. He also has a practice where he is improving people's skin and working on facial rejuvenation with the YoungVitalizer. It is through the experience of improving skin as well as working with scarring that he eventually incorporated many aspects of his practice into improving acne scarring. The results that you're seeing in the before and afters are based on a 5-7 step process. Each step can help different types of scars. Some steps help ice pick scars. Some steps help box car scars. Still other steps help rolling scars. As we said before there are other steps that we discussed before that can help elevated white scars. In Dr. Young's experience, he is seeing much better results with one treatment using the Acne Scar Vitalizer than multiple treatments using traditional methods. You can get real results with just one treatment. You can find out more about our Unique Approach, The Acne Scar Vitalizer Treatment, by calling us at 425-990-3223 or emailing us at contactus(at)afbplasticsurgery.com. 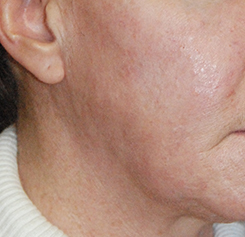 After Multiple Excisions, Fat Grafting and Co2 Laser Active Fx Resurfacing. Results after 1 1/2 years! “Dr. Young, I love my results. I went on a date the other night and my date told me my skin looked fabulous. I’m so happy!” — NL. Our approach for excision is a geometric line closure excisional approach. 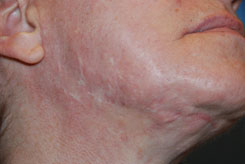 You can see more examples of this type of scar revision here: Aesthetic Facial Plastic Surgery Scar Revision.